The Parklane Pivot Door is our most versatile swing door . . . and that versatility can work for you. The Parklane Pivot has a full 2-1/4" horizontal adjustment, two heights (65-1/2" and 69-1/2") and eight different widths ranging from 22" to 36". The Parklane Pivot also provides a custom leak-proof seal thanks to its full length magnetic latch system, adjustable strike jamb, and the two-piece, easy-to-install drip system. 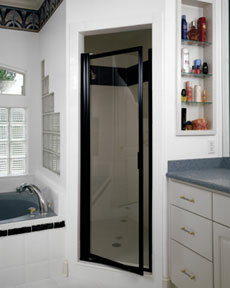 The reduced swing radius of the door makes it the perfect choice for even the smallest bathroom. The quality craftsmanship of the Parklane Pivot Door is seen in its heavy duty extrusions, available in Silver, Gold, and custom colors. Fits Openings 31 3/4" x 32 3/4" x 64 7/16"
Fits Openings 21 3/4" x 22 3/4" x 67"
Fits Openings 22 3/4" x 23 3/4" x 67"
Fits Openings 23 3/4" x 24 3/4" x 67"
Fits Openings 24 3/4" x 25 3/4" x 67"
Fits Openings 25 3/4" x 26 3/4" x 67"
Fits Openings 26 3/4" x 27 3/4" x 67"
Fits Openings 27 3/4" x 28 3/4" x 67"
Fits Openings 28 3/4" x 29 3/4" x 67"
Fits Openings 29 3/4" x 30 3/4" x 67"
Fits Openings 30 3/4" x 31 3/4" x 67"
Fits Openings 31 3/4" x 32 3/4" x 67"
Fits Openings 32 3/4" x 33 3/4" x 67"
Fits Openings 33 3/4" x 34 3/4" x 67"
Fits Openings 21 3/4" x 22 3/4" x 70"
Fits Openings 22 3/4" x 23 3/4" x 70"
Fits Openings 23 3/4" x 24 3/4" x 70"
Fits Openings 24 3/4" x 25 3/4" x 70"
Fits Openings 25 3/4" x 26 3/4" x 70"
Fits Openings 26 3/4" x 27 3/4" x 70"
Fits Openings 27 3/4" x 28 3/4" x 70"
Fits Openings 28 3/4" x 29 3/4" x 70"
Fits Openings 29 3/4" x 30 3/4" x 70"
Fits Openings 30 3/4" x 31 3/4" x 70"
Fits Openings 31 3/4" x 32 3/4" x 70"
Fits Openings 32 3/4" x 33 3/4" x 70"
Fits Openings 33 3/4" x 34 3/4" x 70"